About Georgia Industrial Minerals, Inc.
Georgia Industrial Minerals was created in 1995 to recover sand from the sedimentary ores that contained mica, sand, and clay. Very quickly it was realized that considerable mica had to be removed in order to upgrade the sand products. The emphasis was shifted from sand to mica and the patented technology was developed and implemented. Since 1997 this facility has been dedicated to improving the recovery of muscovite mica. During this time, GIM has gone through several plant expansions to increase mica capacity and add new mica products. GIM is capable of producing a large family of muscovite mica products, including wet ground, dry ground, micronized and flake muscovite mica products. 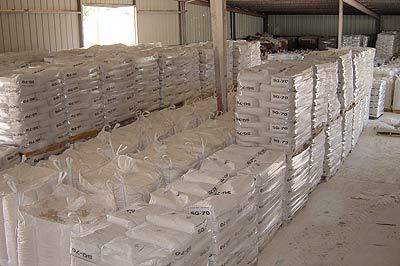 Georgia Industrial Minerals is the only muscovite mica facility that mines, processes, and grinds micaeous ores from sedimentary deposits. The area that is mined was once a Coastal Plain that collected large volumes of sediment of weathered igneous and metamorphic rocks that were deposited in this Coastal Plain many years ago. Subsequent leaching by ground water over the years dissolved the trace impurities in these sedimentary deposits and the results are very white individual flakes of mica that easily delaminate into very thin mica flakes with excellent slip and sheen. GIM controls numerous tracts of land in this Middle Georgia area which hold large reserves of micaceous sediments. Based on our exploratory drilling and laboratory testing, we estimate that our present proven mica reserves exceed 500,000 tons of mica. Additional drilling would increase this proven reserve base significantly. GIM is fortunate to be located in Middle Georgia where about 60% of the world's output of kaolin clay is produced, and where the mining industry is highly respected, appreciated, and encouraged by local citizens.